Swiss luxury watch manufacturer launches 8 pieces for 5th edition of “Le Cabinet de Curiosités of Thomas Erber” at SIWILAI & Central Embassy in Bangkok JEANRICHARD reveals the “Limited Edition Terrascope for Le Cabinet de Curiosités of Thomas Erber” that the Swiss luxury watch manufacturer will present at the opening event on 20th November 2014 in Bangkok. The 5th edition of the annual exhibition is taking place from November 20th until December 21st 2014 at the Central Embassy Luxury Retail Project & SIWILAI Concept Store. The timepiece will then be on sale in a limited edition series of only 8 watches worldwide. 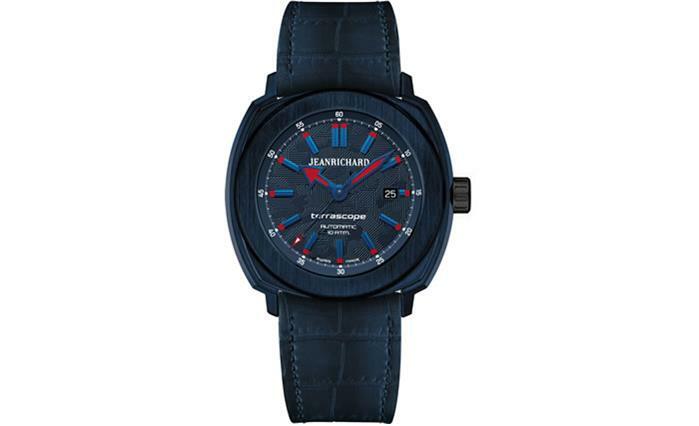 JEANRICHARD will be present among the more than 70 international guests, launching this innovative aluminium timepiece with a “rubbergator” strap in all mystic blue with just a few red and white color nuances created exclusively for this event and in honor of the host country. JEANRICHARD participates in the 5th edition of “Le Cabinet de Curiosités of Thomas Erber” with a highlight made in mystic midnight blue. The number of the very special Terrascope edition is limited to eight pieces only, playing tribute to the Asian culture. The frame of the automatic timepiece consists of a blue eloxed aluminium middlecase, bezel and laterals inserts, which provide the solid foundation of this limited edition. It is held in a polished and vertically satin-finished aluminium case. The black crown as well as the case back are made of lightweight titanium. The timepiece features a special “CDC-SIWILAI” engraving with the symbols of the concept store as well as of the CDC on the back. The blue dial is embellished with an artistic threedimensional camouflage print that complements the eclectic blue of the whole watch. The hands come in blue steel with red luminescent material, while the JEANRICHARD logo and “Terrascope” lettering are held in classic white. Additionally, the timepiece features the brand new “Rubbergator” strap – a revolution among the bracelets, made of 100% water resistant rubber that has the same look and the feel of an alligator skin down to the smallest details. After being a renowned journalist, writer and special correspondent in the fields of culture, trends and travel for 15 years, Thomas Erber became editor-in-chief of the lifestyle supplement for the newspaper Le Monde and a reporter at large for Vogue Homme International, and actively participated in the launch of Jalouse and l’Optimum. Thomas Erber is the founder of the internationally acclaimed Cabinet de Curiosités in the most prestigious cities in the world. In addition, he is an international brand consultant of highly prestigious brands (Richemont, Pernod-Riccard, Kuoni, etc.) with a very high quality of global networking. His yearly exhibition, which started in 2010 at Colette in Paris, followed by events in London, Berlin and New York, has continuously grown in awareness and reputation ever since. The Cabinet de Curiosités of Thomas Erber contains finest pieces from well-known and prestigious contributors from around the world in the fields of fashion, design, high jewellery, art, photography and many more. Each guest makes a unique or very limited edition piece, aimed at enhancing the essence of his artistic work or brand and especially created for the Cabinet de Curiosités of Thomas Erber. JEANRICHARD is part of the Kering Group, a world leader in apparel and accessories which develops an ensemble of powerful Luxury and Sport & Lifestyle brands.